My friend Lauren Markowitz Sheinberg is my guest blogger today! 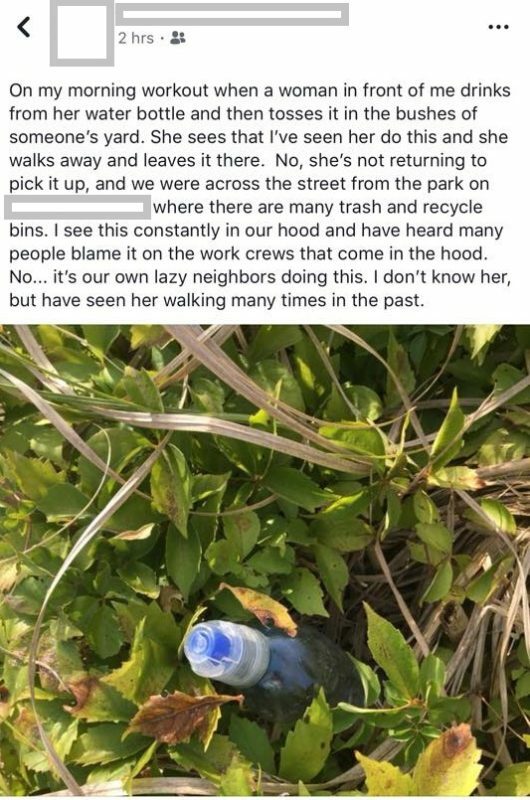 This week, something that’s pretty commonplace with runners (stashing a water bottle) turned into a neighborhood kerfuffle thanks to social media. 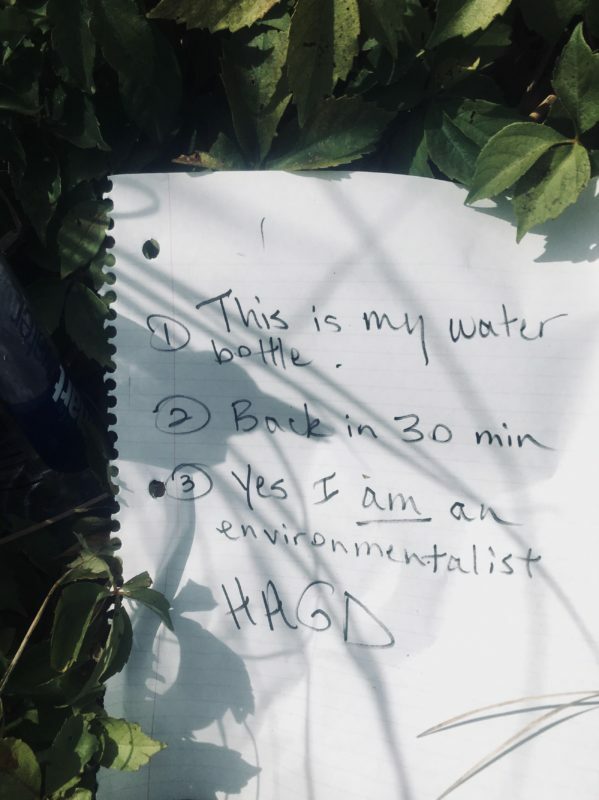 Just last week I wrote about some of the challenges we encounter (one of which is water stops) when we run, so I invited her to share her story. Yep. That’s MY water bottle. It was tucked in my neighbor’s shrub on the corner of the street where I live. If you’re reading a running blog, you obviously know that stashing a water bottle is completely unremarkable. 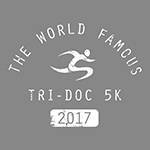 For 15 years in this particular neighborhood, I have run some variation of a six-mile route, always tucking a water bottle near the halfway point. This shrub in the picture is four houses away from my home, but let me be honest: I’m lazy. If I stashed the water on my own front porch I’d probably bail on the second half of my run. Hence, the bush on the corner, the scene of the crime. Every time I finish my run, I grab the empty bottle and shuffle home the remaining four house lengths. Why has cyberbullying become acceptable? Do people think it’s okay because we’re adults? No one would tolerate some of those Facebook comments from kids. 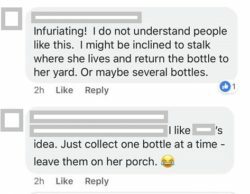 Threats of “stalking” someone to see where they live so you can litter their lawn with bottles? Calling someone lazy and entitled? Yes, I am an environmentalist, and yes it’s a disposable bottle, but I was reusing one I got at the airport. 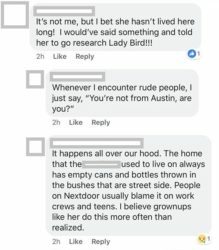 And OUCH: new to Austin? Okay that’s hitting below the belt. I’ll have you know I’ve been here longer than Mopac. Facebook and other social media outlets such as Nextdoor were created to bring people together and share information. Yet increasingly social media seems to be used for publicly shaming people and cultivating the mob mentality. Take a picture! Gotcha! If that woman had time to take the picture and write the accompanying post of indignation, why didn’t she simply say something to me in person? She hid behind her computer and used social media to start a neighborhood scandal. Our own Water-gate. So what happened when I returned home after my run, water bottle in hand, and read this post and comments? I went from experiencing an endorphin high to a sad and angry low. Upset, I posted screenshots of the hateful comments on my own Facebook page, which helped me vent, but the hypocrisy of that is not lost on me. I used social media to shame the shamers. Water-gate indeed. Two wrongs…. In the future I’ll show more restraint and use social media to connect with, rather than rant about, other people. Today’s note was not as eloquent as Woodward and Bernstein, but I was eager to stash my bottle and start my run. After many years of speed work and marathons, Lauren Markowitz Sheinberg is now a social runner and member of Austin Runners Meetup. In addition to her passion for running, Lauren enjoys spending time with her three kids and practicing corporate law.